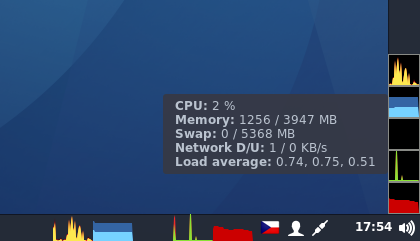 This applet uses glibtop to get system resources usage statistics and displays them in graphs and also as text in tooltip. All graph colors and sizes are configurable. Color settings support alpha channel, for ex. setting background alpha to 0 can make the background transparent. Cinnamon settings API is used. All changes are applied on the fly and it is not necessary to restart the Cinnamon. After using this for a number of days, I can report complete satisfaction. I wanted to know about CPU load, RAM usage, and swap usage, most particularly - in real time, without having to open a window to find this information. This application gives me all this and more in a single quick glance, with detailed specifics if I mouseover. Well done!